This project ended successfully on 17/6/2018 14:00! You receive a reservation with the best seats for a performance in Aarau or Zurich (max. 4 seat reservations per patron, admission free) - please write immediately an email with a comment that you've pledged to info@jeannine-laeuffer.com. Please do also inform us about the desired dates. You receive a CD recording of the full piece and a reservation with the best seats for a performance in Aarau or Zurich (max. 4 seat reservations per patron, admission free) - please write immediately an email with a comment that you've pledged to info@jeannine-laeuffer.com. Please do also inform us about the desired dates. We will mention you as a sponsor in our program booklet. You are also allowed to visit us at one of our rehearsals, in addition you receive a CD recording of the full piece and a reservation with the best seats for a performance in Aarau or Zurich (max. 4 seat reservations per patron, admission free) - please write immediately an email with a comment that you've pledged to info@jeannine-laeuffer.com. Please do also inform us about the desired dates. You'll get a private piano lesson by the composer and pianist Jeannine Läuffer (only in the German speaking part), we will mention you as a sponsor in our program booklet, you're allowed to visit us at one of our rehearsals and you receive a reservation with the best seats for a performance in Aarau or Zurich (max. 8 seat reservations per patron, admission free) - please write immediately an email with a comment that you've pledged to info@jeannine-laeuffer.com. Please do also inform us about the desired dates. 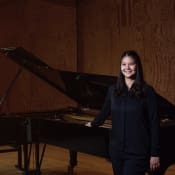 Jeannine Läuffer (*1996) is studying contemporary composition (Bachelor of Arts in Music) with Mathias Steinauer and Felix Baumann and piano (minor) with Adalbert Roetschi at the Zurich University of Arts (ZHdK). Her music is frequently played in Switzerland and abroad. As a pianist she performs in concerts, as a solo performer as well as in chamber music ensembles.